With Christmas is coming very fast we have fantastic news this week the HL7 Lighted Wall Mounted Magnifying Mirror has come back into stock just in time. The unique features of this lighted wall mount mirror are the large 25cm diameter mirror and the soft halo lighting is uses to show your face in the most natural way. There has been plenty of discussion about the colour of LED lit mirrors with the colour being stark white which is not the best to use when trying to apply the right colour combination cosmetics to your features. With the HL7C there is no need to worry, however lighting in most bathrooms generally through the position of the overhead light fittings that can either throw a shadow over your face or the light bounces of the standard wall mirror found in most bathrooms. Either way it makes it very difficult to do such things as put makeup on, pop your contact lenses in or attend to any eyelash issues. With the halo mirror its light reaches every part of your face including under your eyebrows through light coming on the face from every possible angle. If you have a dark bathroom then application of makeup can be difficult, this mirror will solve that issue forever. With the 25cm diameter mirror it shows your whole face with a gentle 3 times magnification. The transition from looking into the 3 time magnification back into your normal bathroom mirror is easy for your eyes to adjust. Speaking of the normal bathroom mirror we get a lot of enquiries asking why this mirror is not double sided. Double sided for those who don’t know the term means on one side the mirror is magnified and on the other it is standard with no magnification. Our answer revolves around the fact why would you look in to a 25cm diameter normal magnification when generally one whole wall in bathrooms these days has the same mirror or non magnified if you like. Generally people use the normal bathroom mirror for a quick check to see if all is order, the magnified side on the HL7C is meant for close up work. So our view is generally double sided mirrors are a waste unless of course you have a travel style model which makes it very handy when on the run. I should also say that this mirror plugs into a nearby power point with a short curly cord; many people ask how does the light come on because they can’t see the cable. Our photographer does not like a messy image so the cord is tucked away where you can’t see it. There is a push button on off switch located on the mounting plate that screws to the wall making it easy to operate and you will not be required to turn the power point switch on and off all the time. 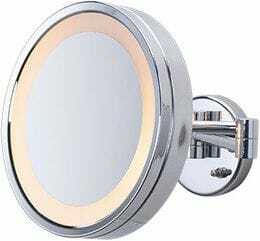 The HL7 lighted wall mounted magnifying mirror comes in several variation those being Chrome or Gold finish and wired to plug straight into a power point or no curly cord so it can be direct wired to the wall without the need of a nearby power point. Thats it for this week so keep smiling enjoy the shopping and have a great run up the Christmas.